Exploring the cityscape of Southern Norway's regional capital on foot. The way my trip to Kristiansand came about is surprisingly straightforward. In late spring 2015, back when I was an MA student in my final year, my Mum and I agreed to go on a (long) weekend break together after the end of my exam session. ‘You pick a destination, and we go’, she said to me. It took me less than a microsecond to know where we were going. 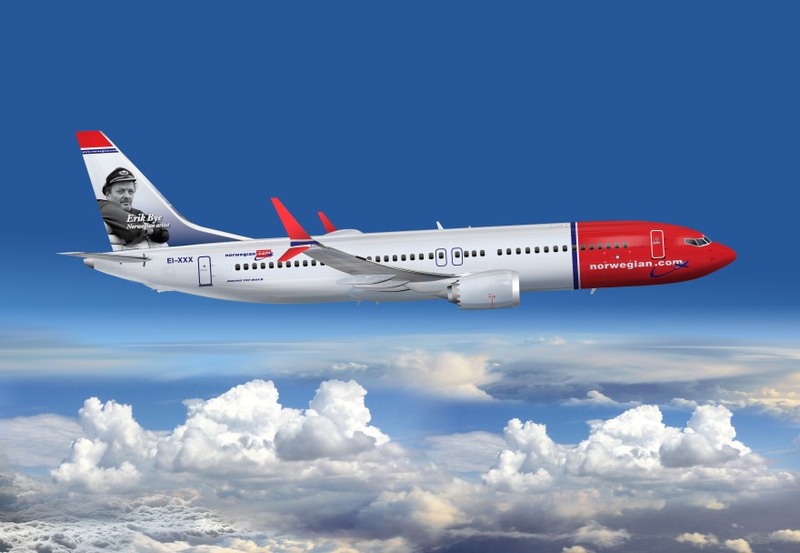 It was only a matter of deciding which part of Norway we’d be visiting. We only had a few days available, so we had to choose wisely. 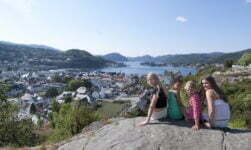 We eventually opted for Kristiansand, capital of Southern Norway (Sørlandet). 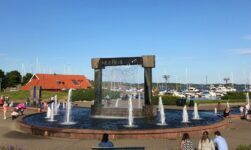 As I later discovered, Sørlandet is also known as the Norwegian Riviera, what with its picturesque towns scattered along the coastline, its secluded beaches and its tiny islands off the mainland. Exploring the southern Norwegian archipelago sounded like a very good idea. 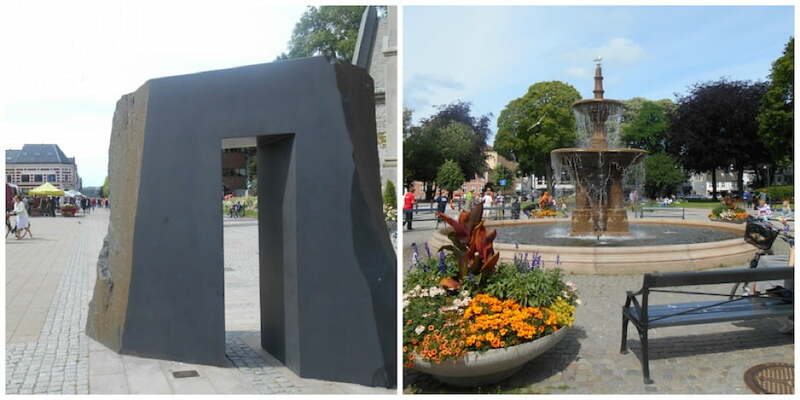 One of the first things I noticed about Kristiansand is its striking Mediterranean atmosphere. The gorgeous weather certainly helped, but it was more than just that. There was something about the colours, the light, the flowers and the fountains near the fortress that led me to this conclusion. If there is one thing that struck me when I first checked the map of Kristiansand, it’s the layout of the centre. It looks like it’s exactly split into two halves: one is like a neat, near-perfect web of perpendicular straight lines, while the other looks like a giant green stain with a few blue dots randomly scattered across the area. As I understood, it was Christian IV (the city founder) that outlined the city plan: 56 rectangular blocks shaped by 9 horizontal and 6 vertical streets crossing through the city. I actually counted 8 vertical and 11 horizontal on the map, but that’s definitely too many blocks. And anyway, with such a layout, how else could Kristiansand’s central borough be named if not ‘Kvadraturen’? Well, that’s where our sightseeing started from. 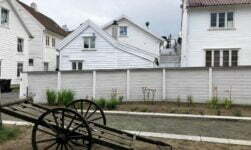 Kvadraturen largely consists of white wooden buildings (especially toward the area called Posebyen, which also happens to be the oldest), shops and restaurants. Honestly, you can’t get lost inside the city centre. The Town Square is the ideal, as well as geometric, focal point of the city. Not only is the cathedral (Domkirke) located on one side of the square; it’s like all roads lead to Town Square. When we got there, we were blinded by sunlight (yes, it was that sunny! Spoiler alert: it didn’t last…), and the square was crammed with tourists and locals having a stroll around the city centre, resting on a bench or simply taking in as much sunlight as they could. Soon after lunch we resolved to leave temporarily the city centre and head north, toward the ‘green stain’ I was talking about. As I read on the guide, the ‘green stain’ consisted in fact of two green areas: Baneheia and Ravnedalen. I wasn’t sure I’d understood correctly: it looked and sounded like a sort of forest, with lakes and woods, right next to the city centre. It was too good to be true. Well, it was true, in fact. 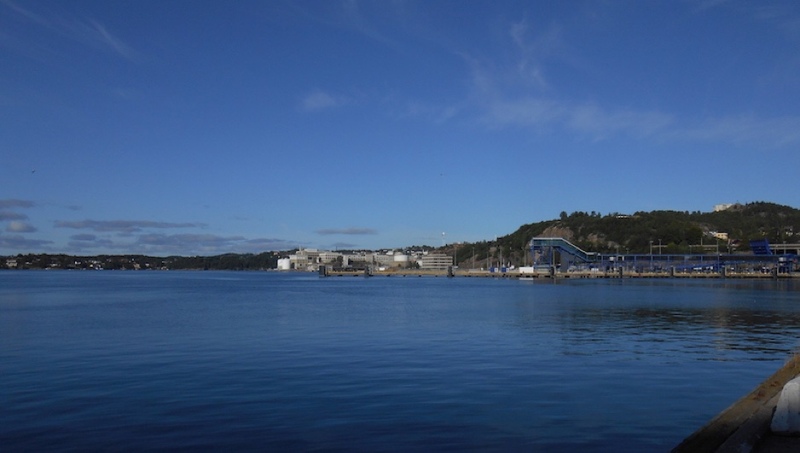 We were so close to downtown Kristiansand, yet so far. 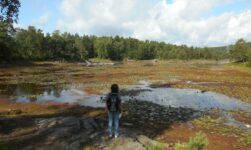 One minute we were crossing over at the traffic lights and the next we were immersed in the silence of nature, the only noises the voices of the (not many) people having a walk around the area or swimming in one of the lakes. 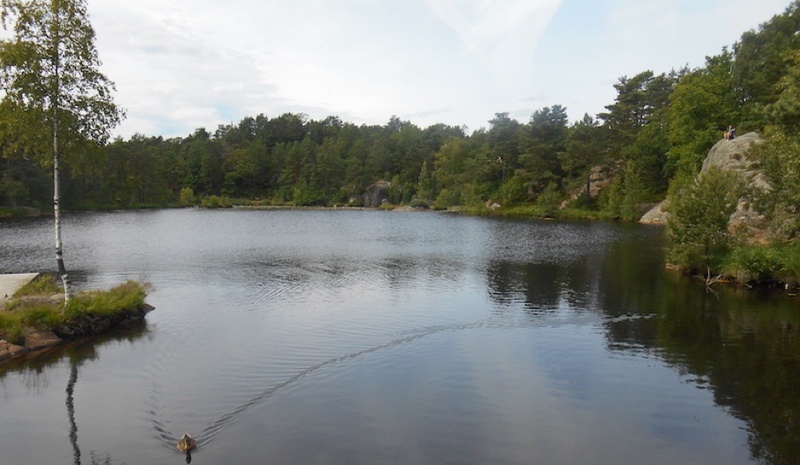 Sadly, Baneheia is especially known for the so-called ‘Baneheia murders’, the murder of two little girls aged 10 and 8 that were raped and killed near one of the lakes, their bodies concealed in the woods until they were retrieved a few days after they had disappeared. The events occurred back in 2000, but left their mark on the Sørlandet and, more generally, Norwegian society – and understandably so. After contemplating water lilies (so many water lilies floating on the ponds! ), dipping out feet in the water and socialising with local ducks, we thought we’d go back downtown. We headed straight toward the sea. Strandepromenaden is, predictably enough, the street that runs along the coast. Right in the middle, just off the main road, there’s Cristiansholm Festning, Kristiansand fortress. 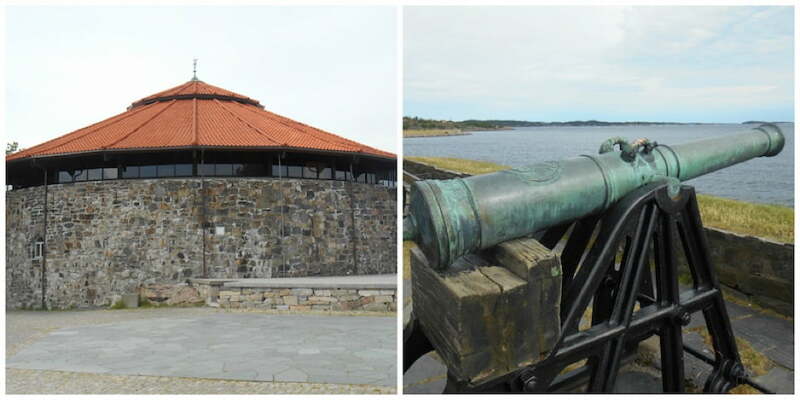 It’s a round, thick-walled building with cannons around the balcony overlooking the sea. A bit further on, right at the end of Strandepromenaden, there’s Bystrand Beach, probably my favourite spot in the city. 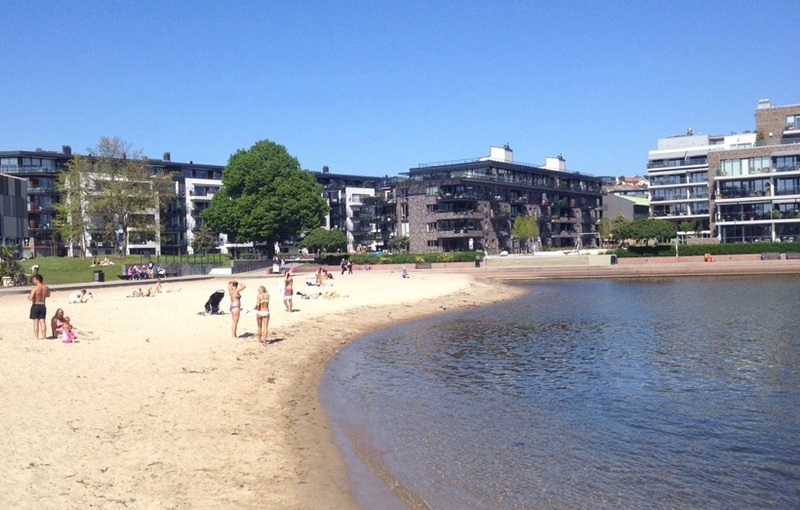 Yes, because Kristiansand has a tiny stretch of beach right next to the centre. I mean, wow. By the time we arrived at the beach the sky had clouded over, and there was virtually no one around. Not one person. Only silence and wind. 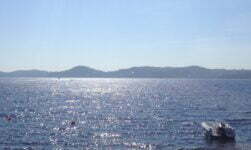 The sky was, if not fifty, at least forty shades of grey, and the sea looked almost black and borderless. There was the most annoying drizzle and the air was getting chillier by the minute. We had a stroll along the beach as far as Verven street, after which my Mum went back to the hostel, so I went back to Verven, right to the tip of the small peninsula, picked my spot, and sat on the rocks. 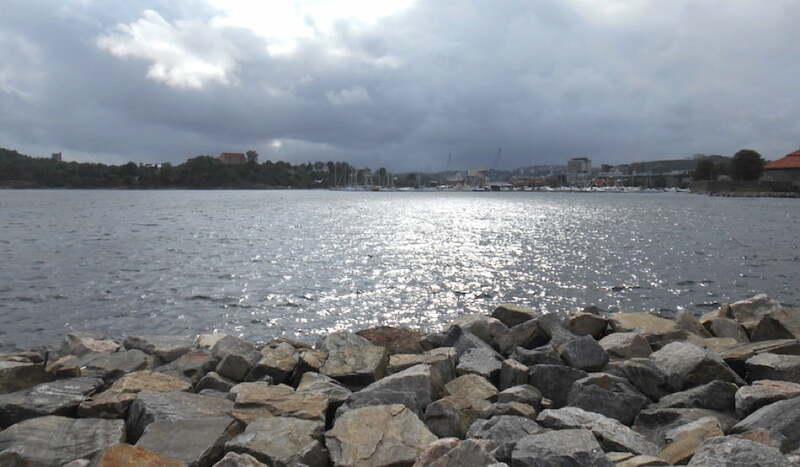 Those forty minutes or so by the sea are amongst my favourite memories of Kristiansand. There was no one around. I like sunny weather, but I love it when it’s all clouded and windy. I love it when the sky is lit by a dim, whitish light that makes the clouds look like they’re backlit, thick and dense, and you can make out their profiles. When the rain grew very thick I eventually made my way back to the hostel. By then I could say I had experienced quite a satisfactory range of weather patterns in one day.